iiyama is one of the world's leading manufacturers of computer monitors. Efficiency, performance, reliability and user comfort are the basis for the development of iiyama products. This success they have achieved through the consistent development of quality in the product and then offer it at an affordable price. From the first day the emphasis was not on mass production, but to apply the human element in all stages of the production process. This philosophy is still central to everything iiyama creates and product development is based on the concept of usability. Using the most up-to-date technology has also become an essential part of the production process and the consolidated procurement has ensured that they remain competitive without sacrificing quality or features. New products are not introduced earlier, before we be sure that they provide a real benefit to the user and adapt to the price / performance policy. The Iiyama ProLite monitors feature a durable resistive touch interface. 5-wire resistive touch for optimal precision and even over time, no calibration required. Available in different sizes. 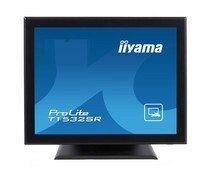 The Iiyama ProLite monitors feature a durable hard glass projective capacitive touch interface. This ensures perfect picture and the touch interface remains even in case of scratches operational. Available in different sizes!